Say Happy Birthday with a Happy Birthday Mug! 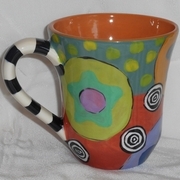 A brightly colored funky mug that will make anyone smile. Written with or without "Happy Birthday" across it.